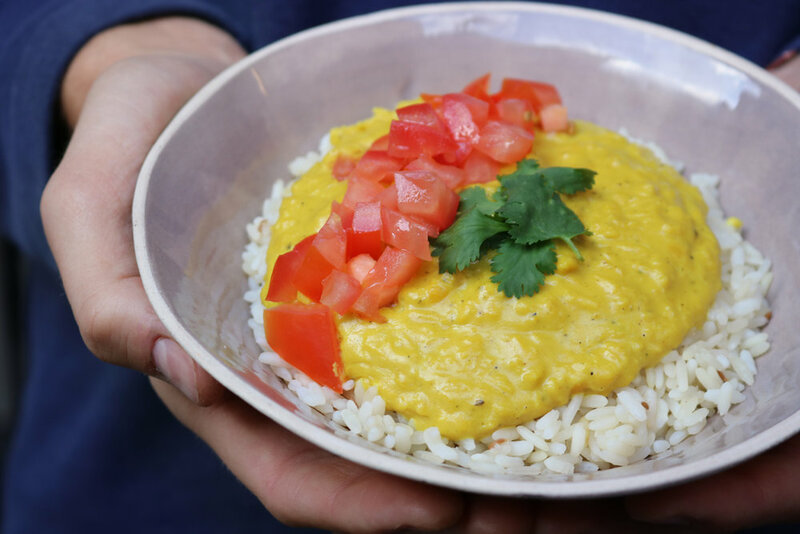 Benn’s super simple weeknight Dahl recipe. In a heavy bottomed pan heat the cumin, coriander, cardamom, turmeric and mustard seeds until fragrant then set aside. Finely dice the onion and start to saute in vegetable oil. In the meantime chop the chilli and garlic and after about 5 minutes (or when the onions are translucent) throw them in the pan along with the spices and cook for a further 2 minutes. Add the lentils and coconut flakes and if it’s looking a little dry throw in another tablespoon of oil and give them a good mix until they’re totally coated in the mix. Add in the coconut milk and then top up with water until the lentils are totally covered, bring the the boil then put a lid on and simmer for 45 minutes stirring regularly, add more water if it’s looking a bit dry.